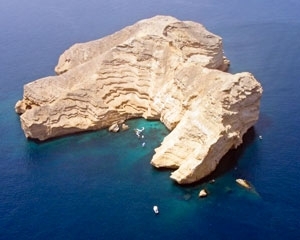 Al Fahal Island (Shark Island) is situated around 4km from the mainland and has an area of just 2.24 km2. It is composed mostly of around 55 to 35 million year old Eocene limestone and marl. This limestone was originally part of the sea floor. It is made up from the shells of marine organisms such as bivalve shellfish, coral and algae, deposited in a shallow marine environment. The island outcrop is now exposed on the surface due to uplift and change in sea levels. Many islands fall within the territorial waters of the Sultanate of Oman. They are havens for Oman’s diverse fish and coral species. Some such as Fahal Island are protected nature reserves requiring permits for access or scuba diving.